American Eskimo Dogs - The American Eskimo Dog is a companion bred dog originating from Germany, decending from the White German Spitz and is a member of the Spitz family of dogs. The breed achieved a high degree of popularity in the 1930's and 1940's in the U.S. as a circus performer. It has been thought that the first dog to ever walk a tightrope was this breed. The breed became popular as circuses would sell the puppies during their travels across the nation. The United Kennel Club recognized the breed in the late 1930's to early 1940's recognizing the Standard and Miniature size only. The American Kennel Club recognized the breed in 1994 in Miscellaneous Class moving them to Non-Sporting Class in 1995 and set the current standard for the breed at that time. The AKC recognizes the Standard, Miniature and Toy size of the American Eskimo Dog. This information is licensed under the GNU Free Documentation License. It uses material from the American Eskimo Dog article on Wikipedia.org. 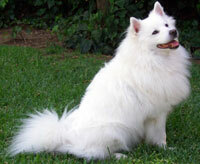 American Eskimo Dog Breeders - Advertise your kennel puppies and dogs here.